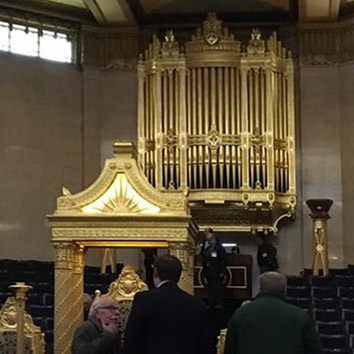 On Saturday 5th March 2016 we were delighted to be given the opportunity of seeing and hearing the Harrison & Harrison restoration of the Henry Willis Instrument. We were treated to a marvelous demonstration of the various stops and the new five stop central section by Andrew Scott FRCO with Ian Bell kindly explaining the work that was involved and the problems faced. When the demonstration was completed we were given a grant tour of the chambers, it was a most agreeable occasion which was appreciated by all. The organ not only looks magnificent (as does this fantastic building) but sounds exceedingly well. The five new stops blend with the original materials and the Grand Tuba will be well used I’m sure. It has been said that the gold leaf used during the restoration was enough to cover the surgace of a tennis court.